Nikon just announced the Spring Photo Contest on Facebook, enter for your chance to Win a Nikon Coolpix W300. This contest is only open to legal residents of Canada who are of the age of majority in their province or territory of residence. 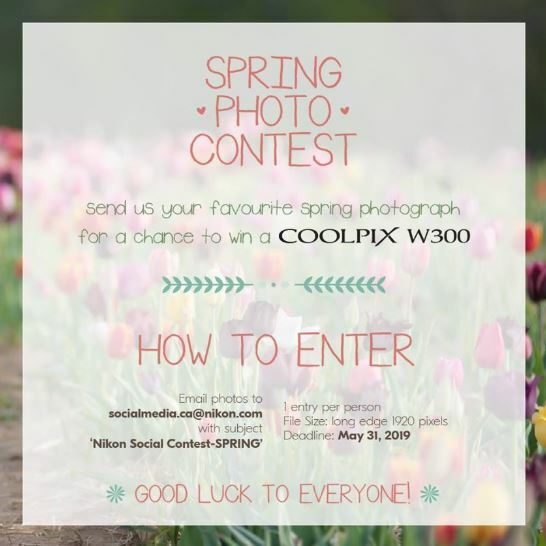 To enter you have to send your “favourite spring photo” via email to socialmedia.ca@nikon.com with the subject ‘Nikon Social Contest-SPRING’ and a description of your photo. There is a limit of one entry per person. Photos have to be captured with a Nikon camera to be eligible. Entries to this contest close on May 31, 2019. Winner will be selected by a judging panel. The winner will get a Nikon W300 camera. The Nikon Spring Photo Contest begins on April 1, 2019 at 12:00:00 a.m. ET and ends on May 31, 2019 at 11:59:59 p.m. ET. The judging will take place within 72 hours after entries close. Winner will be notified by email.